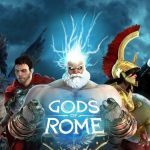 Flaregames has just released a new MMO for Android and iOS devices called Olympus Rising, which puts you in charge of the “epic battle” for Mount Olympus, and to unleash the power of ancient Greek Gods. 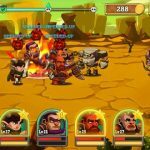 You can form a team of heroes and monsters, and create your own base, fighting other human-controlled players and gathering loot with each victory, while defending your base from those very same players. Aside from collecting heroes and summoning mythical creatures, you can also create your own acropolis to show off your achievements, and form alliances with other human players. All in all, the features of this game aren’t that much different from those of other MMO games – the ability to create a team of heroes, defeat and loot other players, and form alliances or guilds. But the fact that the setting is in ancient Greece does make for a nice twist, and like other games of its kind, there’s enough to make it unique enough on its own. So with that all said, let’s cut to the chase and bring you our Olympus Rising strategy guide. Gold and ambrosia are your main forms of currency in the game, and you can hit the Collect All button to conveniently collect whatever you’ve earned so far. And as a bonus tip, you can also send your hero to one of the conquered islands to have them stand on guard, as guarded islands will earn you more resources than unguarded ones; just go to the map screen and you can take it from there. This is useful if you’re in need of either one of those two currencies. Compared to other MMO games, Olympus Rising tends to be more battle-centric, and while some of you may see that as a drawback, it’s perfect for those who have a lot of time on their hands. You should always be ready to conquer islands if you want to move forward in this game; winning battles doesn’t just reward you with big rewards and bonuses right off the bat, they also serve as a source of tribute. At some point in the game, you’ll unlock the “heart” of Olympus Rising, so to say – its multiplayer mode. That means getting your base ready so that you can protect it from the attacks of other players. When building towers, these should have some barriers next to them; with the barriers’ additional protection, your towers will be effective for a longer period of time. Also make sure to set up different types of towers, and make the path as confusing as possible; this could easily throw off players, especially the newer ones. We probably don’t need to mention this tip if you’re a veteran of the MMO scene, but it is necessary that you join an alliance so you can reap the benefits of multiplayer mode. Being part of an alliance allows you to share resources and help each other out in battle, and it also unlocks additional quests for you. It is also important that you make sure you are joining an ACTIVE alliance for obvious reasons. In addition to joining an alliance, you can create one of your own, though that may cost you some gems, which are the game’s premium currency. Read on for what NOT to do when spending your gems. As gems are a premium form of currency, they are harder to come by than gold and ambrosia. That means you shouldn’t spend them frivolously. When spending them, you can spend the ones earned for free on quests, but you should not spend them on expediting a building’s construction or upgrade. Be patient, and don’t spend those gems just because you’re in a hurry for a building to complete. Ambrosia is another form of currency that, when compared to gold, is harder to come by. And if you’ve got enough of it, you should go to battle so you can move forward and make more progress – we did say above that this is a very battle-centric MMO. But how do you optimize your ambrosia usage? Generally speaking, it’s best to have one hero per group of islands, as you’ll be spending more ambrosia for longer distances traveled from one island to another. But if you’ve got a hero near the islands, you can keep your ambrosia usage at a minimum, or close to that. And when assigning heroes to cover island groups, start with your weakest hero in the first group, working your way upwards as you uncover more islands. And, in relation to one of the earliest tips above, your heroes should be stationed in resource-making islands, especially if that resource is ambrosia. If you want to speed up your progress in the game, go to the Current Upgrades icon and check what’s there to build. 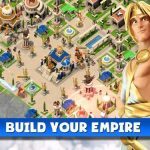 You can follow the game’s suggestions and build a new building, or upgrade an existing one you already have. 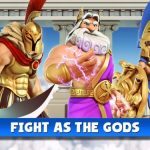 Current Upgrades can also allow you to acquire new heroes, upgrade your troops, or reequip the Guard of Thanatos, which is needed in order to protect Mount Olympus. Items that have “requires building upgrade” next to it will require you to focus your efforts on earning more gold and conquering more islands. Like in other games of this nature, you want your defenses to be as strong as possible. We already covered one way to defend well against other human “enemies,” which is to create as convoluted a path as possible; the more turns, the bigger chances of throwing off other players. Let’s expound on that general strategy a bit. When it comes to setting up your towers, we would suggest placing them in the first third of the road, with this figure based on the starting point of the attackers. This should buy you some time and allow you to create some separation between each batch of troops deployed by your opponent. Next thing you’ll want to do is to set up barriers at the start of the loop, then place more towers on the opposite side of the road. We would suggest two towers per loop and barrier set up. This means opposing archers will traditionally stop to attack the tower, while the tower itself takes them out, while melee fighters will be drawn toward the barrier, as they try to destroy it. For yet another defensive tip, you should remember that your goal is to stave off the attackers for as long as you could. They have a specific amount of time to destroy your gate, and if they aren’t able to do that, they’ll lose the battle. So with that in mind, you should also ensure that your defenses are as far away from the gate, and fairly close to your opponents’ armies. This is the perfect way to stall for time and allow you to produce more defenders from your gate, while doing a number on your opponent’s offense. All the heroes in the game have their own strong points and weak points, so a general rule is to base your attacking game plan on those strengths and weaknesses. But what about the units that you’ll be sending off to battle? Your choice of units is also very important, and we’ll be dealing with that in the next tip. Yes, you read that right – this game seems to handicap ranged fighters, and while you shouldn’t overlook your ranged units, you should maximize the number of melee fighters you bring along. A good point to start would be with two archers, as you then double down on the melee troops. Delay your attack long enough, and make sure you’re close to the starting point, so that the troops you summon will get there faster. You don’t want to see all your units getting slaughtered while you’re at the middle, because that means you’ll be waiting a bit before the reinforcements arrive. Even if you see yourself making good time and in a fairly good position in battle, you should always be summoning new units. By calling for backup, you’re ensuring that any troops you lose are replenished as soon as possible. Yes, there are power-ups that could help you out there in the battlefield, but they won’t help you as much as being on your feet at all times, delaying your attack, summoning troops quickly, and calling for backup even when it doesn’t seem urgent. For now, this is our collection of Olympus Rising tips, tricks and hints. We hope you’ve enjoyed this set of tips and tricks, and they help you progress in the game faster. when you reach level 5 go on the chests tab and put the code unter titan.